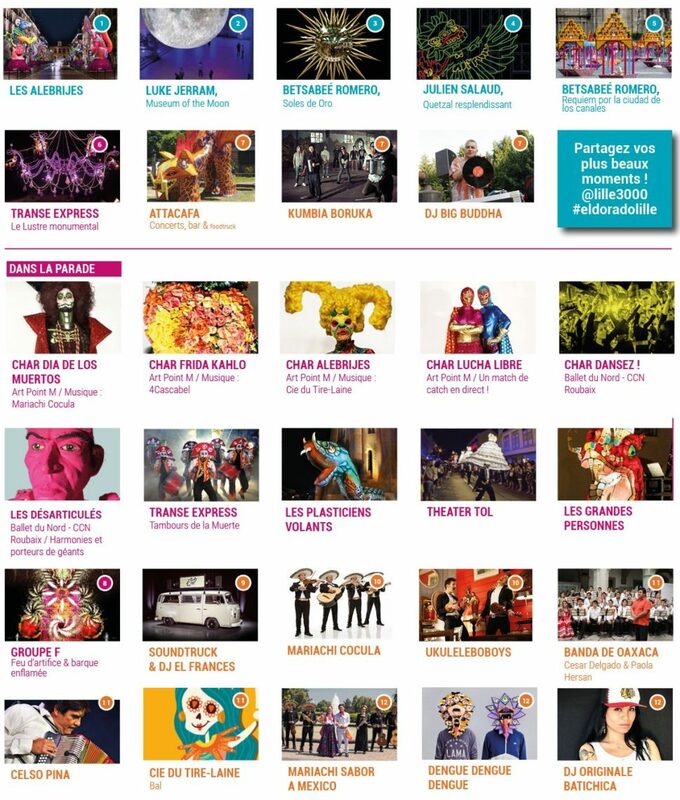 As for each of its editions, lille3000 is launching the Eldorado festivities with an opening parade. On 27 April 2019, the programme will feature: a Mexican voyage in dance and music, with floats and costumes, taking us through Mexico City, Oaxaca and Puebla, cities that symbolise this multifaceted country, where the fusion between ancestral and post-colonial indigenous cultures is omnipresent. A parade inspired by the country’s great festivals, processions and customs (“El Dia de los muertos” or the Puebla parade – its artists and icons – Frida Kahlo or Diego Rivera, La Catrina or the Alebrijes – or its popular traditions – mariachis, bandas, masks and carnival costumes!). Roubaix, Hervé Brisse, music coordinator, Arnaud Van Lancker and the Cie of the Tire-Laine and with the participation of Romain Greco from Mexico City. It will bring together the music schools, concert bands and conservatories of Lille, Lille Métropole and the Hauts-de-France Region as well as the participants of several major casting calls organised from November 2018. With : Art Point M, le Ballet du Nord – CCN de Roubaix, les Harmonies et La Compagnie du Tire-Laine. With its 800 meters long, the great Eldorado Parade is composed of five chariots, many elements of the 2018 Festival of the Dead sent by Mexico, harmonies, amateur participants and professional companies invited for the occasion. – As part of the Vigipirate Plan and the high attendance of this event as well as possible security checks, we recommend that the public arrive early in the downtown area. – The public is asked not to come to the parade with strollers and other bulky objects. Only small backpacks will be allowed. – Dummy weapons will be prohibited in the security perimeter. – The perimeter streets will be closed to traffic from 6:30 p.m. until Sunday, April 28 at 2:00 a.m.
GO WITH ILEVIA PUBLIC TRANSPORTS! – The metro (line 1 & 2) and Tramways run until 1:30 a.m (last departures from Lille Flandres train station). – The public is invited to buy round-trip tickets in advance in order to avoid crowding at ticket offices and ATMs. BE AT THE HEART OF THE PARADE! Take part in the choreography accompanying the Alebrijes du Tire-Laine chariot! by email to compagnie@tire-laine.com or by phone on 03 20 12 90 53. Open to all, no prerequisites required. The Compagnie du Tire-Laine will have a chariot accompanied by 60 musicians with whom some 60 dancers will dance to a choreography by Nathalie Renard, a specialist in popular dances from here and abroad, and Cacau Moutinho, a great Brazilian expert from the Forró. Do not miss anything of our news!